Goddess Danteshwari is a manifestation of Mother Goddess Shakti and is worshipped in the famous Danteshwari Temple at Dantewada in Chhattisgarh. She is worshipped widely in Mandirs in the Bastar region in Madhya Pradesh and Chhattisgarh. Popular belief is that Goddess Danteshwari temple is located in the spot in which the tooth of Goddess Sati fell after her body was cut into pieces by Vishnu to bring back Shiva into the world. Shiva was roaming around the world with the body of Goddess Sati who committed self immolation due to the insults hurled at Shiva by her father Daksha prajapati. This was causing great imbalance in the universe and to protect the universe the body was cut into various pieces. Another legend has it that King Annamdeva was a staunch devotee of Mother Goddess Shakti. She helped in his battles. The Goddess had set the condition that the king should never look back and should move forward in his endeavors by listening to tinkling sound of her anklet. Once during a campaign when the king reached the confluence of Dankin and Shankin rivers, he could not hear the anklet sound and looked back. Mother Goddess disappeared from the spot and the king constructed a temple at the spot. 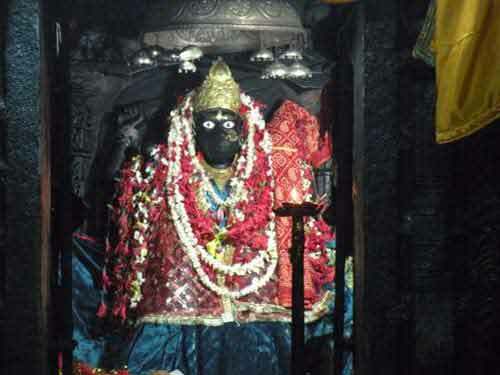 Goddess Danteshwari temple can be found in many parts of Madhya Pradesh and Chhattisgarh.